Since 1988 customers have relied on Brisbane Premier Limo Service as their corporate and personal chauffeur-driven car service for their transfers in Brisbane. We build strong relationships with our customers and go the extra mile, not just in the limousine, but in our service as well. We'll make sure you get where you're going on time, even if we have to be the one who wakes you up. Our service is second to none. We'll do whatever it takes to ensure our clients are delighted with their chauffeur driven service. We go the extra mile. 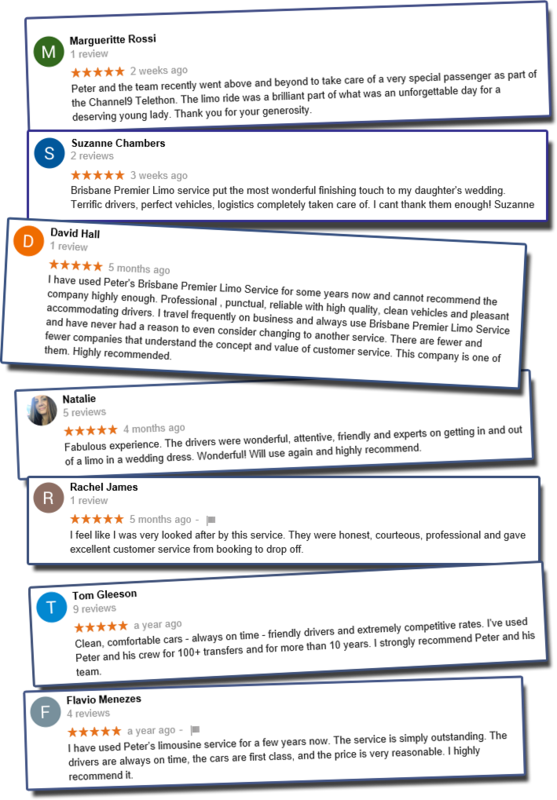 Check out our reviews and read for yourself. We pre book jobs for any hours of the day and are available on the phone 4am - 9pm. We do the little extras to make your life easier. Brisbane Premier Limo Service is no ordinary limousine company. All of our staff are extremely passionate about what they do, as we love getting to know and helping all kinds of people. We offer a personalised service and strive to treat our customers like our friends rather than simply our clients. In fact, we are proud to say that we have watched a lot of our clients grow up. We’ve picked them up as toddlers and in the blink of an eye, they become teenagers, and we find ourselves picking them up at 3am in the morning after a night out. At the end of the day, we are all facing the same issues – teenagers on the laptop, and love for our family and children - so we get it. But don’t worry. What happens in the car, stays in the car. We're a bunch of friendly chauffeurs. We offer more than just a driver – a warm, friendly face and an ear to listen when you need it. We have had a customer tell us that when he saw Peter or one of his drivers waiting at the airport, he felt like he was almost home. We have integrity: We often have customers leave their valuable behind in our vehicles and we go above and beyond to make sure that they are returned exactly as they were left behind. We build up strong rapport with our clients. We have an extremely loyal customer base, who we treat like family. Just to add a little anecdote: Peter had been picking up a lovely elderly lady for a number of years. After purchasing a new car, it took several months to notice that the car was different. She said it was because she uses the service because of Peter and his care, rather than his car! We are on time, every time. We will never let a client down, and take every measure possible to make sure they reach their destination or are picked up safely and on time.